I recently heard gallery walls weren’t the thing to do anymore. Now, I’m not decorating expert, far from it really, but I have two gallery walls happening at my house and I really love them. One of them, in fact, is actually a work in progress, so I have plans to continue adding to it. While I’m not a decorating expert, I do like documenting memories around my house. 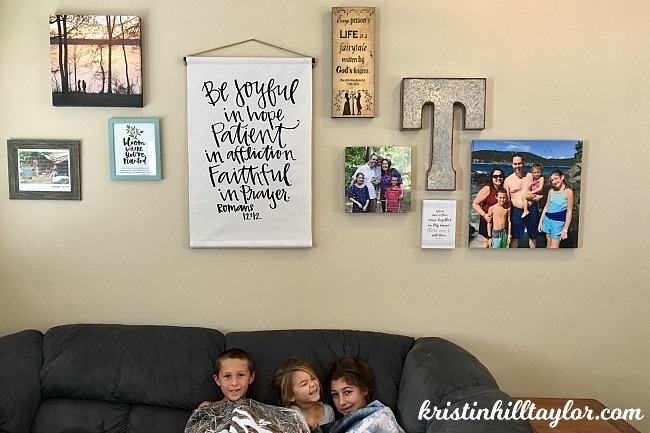 I scrapbook, have binders for my kids’ papers I want to save and books for their school years and birthdays, and hang pictures of our family adventures all around our house. So when MyPix2 approached me about reviewing one of their personalized photo products, I was all in. I chose a 20-inch-by-20-inch wrapped canvas. And I knew which vacation photo I wanted to use. It’s the one on the far right of the gallery wall. My husband questioned why I love this photo because neither boy is wearing a shirt and the girls’ hair is kind of messy, but I love the snapshot moment of our time together at the British Virgin Islands stop on our Disney cruise. The memories that surface when I see life documented around our house is why I hang photos. Setting up an account and ordering the canvas was super easy and quick. It shipped quickly, was well packaged, and looks great on my wall. Yes, the untrendy gallery wall that still in progress. In addition to the wrapped canvas I chose, MyPix2 offers many other products, including prints, banners, greeting cards, photo books, mugs, calendars, and ornaments. Like other photo sites, there seem to be plenty of sale options, so I’d watch for promo codes and deals before ordering to save yourself some money. I suspect I’ll order from MyPix2 again sometime – perhaps even another piece for a gallery wall. I received this wrapped canvas for free in exchange for a review. These opinions are my own and I’m happy to have it hanging on my wall.